The Road to 60: Can Democrats Win a “Filibuster-Proof” Majority in the U.S. Senate? Okay, for non-U.S. readers (and even for many U.S. Americans), the numerous ways in which the U.S.A. is NOT a very democratic republic is confusing. When our Constitution was written and ratified, it was an 18th C. compromise between those who wanted a more robust representative democracy with as much power in the hands of the people as workable in a large, spread-out, nation, and those who feared “mob rule.” Our bi-cameral legislature was one such compromise. The House of Representatives is directly elected: with states awarded so many Reps. based on state population and every House member needing to stand for reelection (or defeat) every 2 years. But the Senate, loosely based on the British House of Lords (except without inherited seats or seats based on clerical office, etc. ), was originally elected by each state legislature. It took a Constitutional amendment for Senators to be directly elected. And each state, no matter population, gets exactly 2 Senators. They each serve 6 years at a term and only 1/3 of the Senate is up for re-election at any given time, so a “throw all the bums out” mood can only go so far in the Senate. Likewise, while bills need only a simple majority to pass the House, they must have 60 (out of a 100 Senators) in the Senate to come to a vote on the floor. Otherwise, a “filibuster” or endless debate without vote, can be used to kill a bill. (For generations this was used during slavery to keep anti-slavery bills from even being voted on–and later it was used for generations to kill civil rights legislation, keep women from voting, etc.) Sometimes this feature is a good thing. If a radical faction controls the House, the Senate can keep it from passing unwise legislation. And, when it functions correctly, it forces Senate members to gain cooperation from the other major party in order to pass legislation, confirm Supreme Court justices (and federal judges), Cabinet members, ratify international treaties, etc. But it can be used in a very obstructionist way. When the Democrats gained the majority in both Houses in ’06, with only a 51 seat majority in the Senate, Senate Republicans decided to block all major Democratic legislation, no matter how much supported by the public (especially, but not only, all attempts to end the occupation of Iraq). With the nation facing such extreme problems, now, the Democrats decided for a bold effort this time not only to elect the next U.S. President (which now looks extremely likely unless Obama himself screws up in a major way), and to expand their majority in the House, but to attempt to get at least 60 seats in the Senate and prevent such obstructionism. A 9 seat pick-up (or 10 if Liebermann (I-CT), former Dem who is for McCain, switches parties–or simply decides to caucus with the Rs, if McCain loses) is usually all but impossible. But this year several factors were different: of the 1/3 of the Senate which had to stand for re-election, far more were Republicans than Democrats; several Republican Senators unexpectedly retired this time (and one died in office unexpectedly); the national mood has favored Democrats in general since mid-’05; Obama has very strong “coattails” in many places that could pull Democratic candidates in close races over the line with him; the Democrats have generally done better than the GOP this year in recruiting strong candidates for particular races; and, amazingly, the Democrats have done better than the GOP in fundraising for their candidates–for perhaps the first time since WWII; Republicans only had about 3 chances for a pick-up and botched all of them. They are not expected to take any Democratic seats to make up for their losses this year. Nonetheless, the road to 60 has seemed a longshot. But suddenly, it seems almost within reach. Virginia: Two years ago, Virginia had 2 Republican Senators, as it had for decades. Then, in one of the most exciting races of ’06, Jim Webb (D-VA), a former Republican who had been Sec. of the Navy under Reagan (a TRUE maverick who is deeply committed to the poor, to prison reform and many other “liberal” causes, but who is pro-gun, deeply pro-military [though not militaristic–and against the Iraq war/occupation], and who doesn’t think Democrats should have gotten involved in the struggle for gay rights because he believes it distracted/hindered our ability to mobilize on behalf of the poor! ), won a narrow upset victory over Sen. Wayne Allen (R-VA). Then, to everyone’s surprise, VA’s other Senator, John Warner (R-VA), decided to retire rather than run for reelection this time, leaving this an open seat. (Open seats are much more vulnerable to a party switch than seats with defending incumbents.) The Republican candidate, former Gov. Gilmore (R-VA), was deeply unpopular and wrecked VA’s economy. The Democratic candidate, Mark Warner (D-VA), no relation to retiring Sen. John Warner (R-VA), was the Democratic governor who replaced Gilmore and cleaned up his mess. Not surprisingly, this race has never been close and now Warner (D-VA) leads Gilmore (R-VA) by 30 points! Safely Democratic. Virginia is changing. New Mexico: This was also an open seat due to a retirement. Democrats immediately nominated their strongest candidate, Rep. Tom Udall (D-NM), the 2nd most popular Democrat in the state–right behind Gov. Bill Richardson (D-NM). The Republicans, on the other hand, had a bruising, nasty, primary and selected far-right, unpopular, U.S. Rep. Steve Pearce (R-NM). If they had chosen his competitor, Heather Wilson(R-NM), a more moderate Republican in a moderate, swing state, they would have had a better chance at keeping this seat, although Udall would still have been a formidable opponent. As it is, T. Udall has retained a double-digit lead over Pearce throughout the race. Safe Democratic. New Hampshire: The “Granite State,” like most of New England, was long a Republican stronghold. But the type of Republicanism that thrived here was the Republicanism of Eisenhower and Ford–moderate, Chamber of Commerce, types, deeply suspicious of far-right Neo-Cons or of the fundamentalist Religious Right. As the latter 2 groups have all but completely taken over the GOP, it has lost favor in New England. Sen. John Sununu (R-NH), son of the Reagan cabinet member, is moderate in today’s GOP, but NH is growing more liberal and his party’s name is now poison. Democratic candidate Jeanne Shaheen (D-NH) is a former governor who was fairly popular, although she angered NH Democrats when she vetoed a bill to do away with NH’s death penalty (which hasn’t been used in decades). This race has had its close moments. It hasn’t been a runaway, but Shaheen now leads by 10 points and, with NH now firmly in the Obama column in almost all polls, Shaheen’s victory seems assured. (Obama’s lead is itself surprising: John McCain won the NH Republican primary in both his races for the White House and has been here so often since ’00 that he could practically build another home here! And, NH bucked the polls and went firmly for Clinton in the Democratic primary, giving Obama his first primary defeat. Shaheen was co-chair of Sen. Clinton (D-NY)’s presidential campaign committee–and one of the last to reconcile to her defeat. Yet Obama leads McCain here by 13 points and Shaheen will benefit from his coattails.) Nearly Safely Democratic. North Carolina: This once deeply Republican state is turning Democratic–but not at as fast a rate as some other places. Still, the changes are amazing. In 2000, this GOP senate seat was still held by the notorious “Senator No,” arch-segregationist (and unrepentant racist demagogue) Jesse Helms (R-SC), who died earlier this year. When Helms retired in ’02, the seat went to Elizabeth Dole (R-SC), wife of former U.S. Sen. Majority Leader Bob Dole (R-KS) who unsuccessfully ran for president against Bill Clinton in ’96. Liddy Dole has been a longtime GOP operative and is somewhere between her husband’s brand of moderate Republicanism and the far-right nastiness of Helms. Changing demographics, more Latinos and people moving in from out-of-state to work in the high-tech areas of the “Research Triangle” (Raleigh, Durham, Chapel Hill), and rising levels of education have brought a liberalizing effect. Although it will be close either way, NC is too close to call in the presidential race between Obama and McCain–despite not having voted Democratic in a presidential campaign since going for Carter in ’76! Into this situation, Democrats selected State Senator Kay Hagan (D-NC), a pragmatic centrist with deep NC roots (there is much NC resentment that Dole is seldom in the state and has her primary residence at the Watergate Hotel in D.C.) to challenge for this seat. Dole is a one term senator, which is the next most structually vulnerable situation to an open seat. Right after the Democratic primary, Hagan was only 5 points behind Dole. Then Dole dumped a bunch of advertising dollars into the campaign and seemed to lock up her reelection with a 15-point lead. But then Hagan caught her in early Sep. and the polls of the last 3 weeks have all shown her leading Dole–by an avge. of 5 points. The latest poll showed Hagan 10 points up. Even if Obama falls short of flipping this state, Hagan is likely to benefit from increased African-American and Latino voting this time and from young, first time voters registered by Obama and the Dems–since first-time voters who vote in the same year they are registered show up at about 75%. Likely Democratic pick-up. Alaska: This seat should have been safe in Republican hands. Alaska has been a very Republican state ever since it first became a state in the late ’50s (first voting in a presidential election in 1960, along with Hawaii). There hasn’t been an Alaskan Democrat in the U.S. Senate since 1980 when Sen. Mike Gravel (D-AK), an old-fashioned liberal, was defeated in the Reagan revolution. This seat’s current occupant, Ted Stevens (R-AK) is the longest serving GOP Sen. He has never faced a close election, always winning by 60% or more of the vote. If he holds onto his seat this time, it will be by a MUCH narrower margin. Stevens was embroiled in the infamous “bridge-to-nowhere” scandal (which also snared Sarah Palin when she first ran for Gov., though she claims to have later told Congress to forget it) and he has been indicted for taking bribes from the VECO corporation. The FBI raided his office and found money in his freezer in big stacks of bills and a large paper trail. Stevens’ bribery trial is ongoing. When first indicted, it gave a HUGE boost to the Democratic candidate, Anchorage Mayor Mark Begich (D-AK), but the nomination of popular AK Gov. Sarah Palin (R-AK) as McCain’s Vice Presidential running mate has narrowed this race again, with 2 polls actually showing a 1 pt. lead for Stevens. But Begich’s avge. lead is 2.8% and the Troopergate scandal for Palin has dimmed her ability to help Stevens. Obama has no chance of winning here, but I don’t think McCain/Palin will have a coattail for Stevens simply because his corruption is a matter of statewide disgust. Begich might win even if Stevens is aquitted (and the prosecution has not run a good case, to the disgust of the FBI). Tilts Democratic pick-up. Minnesota: A quirky state with a tradition of liberal to moderate Republicans, but also some of the nation’s most famous liberal Democrats. It had begun trending more conservative, but now seems to be returning to center-left. Incumbent Sen. Norm Coleman (R-MN) was appointed, and then won in a special election this seat when Sen. Paul Wellstone (D-MN), a raging progressive who used to say he was from “the Democratic wing of the Democratic Party,” died in a plane crash in ’02. Coleman ran as a moderate, but has voted the way George W. Bush asked him to 97% of the time–and few places other than Vermont and Massachussetts dislike Bush more than MN! The Democrats (who in MN are known as the Democratic-Farmer-Labor Party!) had a VERY crowded primary field, increasing Coleman’s chances of keeping his seat. (I like Peace and Justice Studies Prof. Jack Nelson-Pallmeyer, but he didn’t make it. I hope he keeps trying for high office. We need more elected peacemakers.) Eventually, the Democrats picked comic and news commentator, Al Franken (DFA-MN), who almost immediately lost ground when it was revealed that some of his early routines were rather “blue.” MN saw this as “pornographic humor.” In mid-summer, this race seemed lost. Then, Coleman was caught with several scandals and the race was competitive, again. Since late August, this race has been a virtual tie. But in the latest poll (since the 2nd Senate debate), Franken has surged to a 6 point lead and now has an avge lead of 2.2! Tilts GOP, but Franken may be on his way to an upset victory! Also, Obama should have coattails, here, although there has been so much variation in the MN polls that John McCain could actually pick this one off–a major upset, but not enough to ensure his victory–but maybe enough to keep Coleman’s seat. Coleman has announced that he is dropping all negative campaigning! Independent candidate Dean Barkely is Libertarian and is polling at 14%, so, depending on whether he takes more of Franken’s voters or more of Coleman’s could be the deciding factor. Georgia: This is another case of what a difference a few weeks makes! Sen. Saxby Chambliss (R-GA) had narrowly defeated Sen. Max Cleland (D-GA) in ’02 in one of the nastiest campaigns of that year. Chambliss used the issue of terrorism, which was legitimate, but his ads implied that Cleland, a Vietnam veteran who lost one arm and both legs in combat, was not patriotic! This smear infuriated GA Dems (and Dems all across the nation, including me!) and they targeted Chambliss for defeat as soon as his term was up this year. But, initially, it looked to be a vain effort. The Democratic primary in GA wasn’t until July and the field was so crowded that no candidate gained more than 50%. So, there was a runoff in early August won by Dale Martin (D-GA) a state legislator. It seemed too late. He was behind Chambliss by 12 points! But that lead has narrowed every poll and yesterday, it became an EXACT TIE! Further, although still not expected to take the state, Obama has surged in GA in recent weeks, even getting ahead by 1-2 points in a few polls! So, Martin could be about to give an even bigger upset than Franken in MN! Leans GOP retention. Kentucky: This was another big target. KY is a “purple state” that votes Democratic locally and usually Republican nationally (although it voted for Clinton twice, it turned around and voted for Bush twice and McCain has a strong lead here). Sen. Mitch McConnell (R-KY) has been in the U.S. Sen. for 24 years and never had a close race. Since he is the Senate Minority Leader (i.e., Obstructionist-in-Chief), removing him would be worth removing any 2 other GOP senators for senate Democrats. But we seemed to blow it. Instead of selecting Louisville attorney and Lt. Col. in the U.S. Marine Reserves, Andrew Horne (D-KY), who went to Iraq but came back to oppose the war, who was running a great grassroots campaign, the KY Dem. Party forced him for the race for Businessman Bruce Lunsford (D-KY), who has funded as many GOP campaigns, including McConnell’s, as he has Democratic ones. I thought this race was all over and I don’t LIKE Lunsford. (If he wins, I’ll be glad McConnell’s gone, but I will try for a primary challenge in 6 years and, if Lunsford faces off against a better, moderate, Republican, I may cross party lines. He’s not that much better than McConnell, really.) But, funded by his own money, and helped by the crashing economy, Lunsford has pulled even with McConnell. An exact tie in some polls and a point or 2 ahead or behind in others. McConnell’s vote for the bailout has turned many of his own people against him, here and Lunsford has successfully tied him to the deregulation that caused this mess. But Obama has no coattails here, so I have no idea whether Lunsford can upset McConnell or not. It IS the closest race of McConnell’s Senate career. Texas: Sen. John Cornyn (R-TX) is a Bush disciple–and even Texas is getting tired of Bush. His challenger, State Sen. Rick Noriega (D-TX), an officer in the TX National Guard who has done tours of duty in Iraq and is for a quick end to the occupation and paints Cornyn as a chickenhawk. Democrats are making gains in TX, hoping to retake the legislature this year and the governor’s mansion in ’10. And Latinos are now 33% of the TX population with African-Americans another 13%. So, Noriega should have been able to run a strong race. He was initially a good fundraiser, but then it dropped off. Texas is an expensive place to run a senate campaign. As late as August, most Texans had never heard of Noriega. However, the recent hurricanes and the economic meltdown have tainted Republicans even in Bush country. If the Democratic Party pumped in large money to help Noriega get his message out with 3 weeks to go, maybe he could pull off a miracle, but I think he has run out of time. Likely Republican retention. Oklahoma: Another deeply Republican stronghold where McCain leads by 33%. But in OK, as elsewhere in the West, Democrats have begun to make inroads by using environmentalism as a wedge issue–getting hunters and ranchers to team up with eco-friendly folk against overdevelopment. State Sen. Andrew Rice (D-OK), whose brother died in 9/11, who was a missionary with a Havard divinity degree, has made the environment the center of his campaign. And his opponent, Sen. Jim Inhofe (R-OK), is an idiot who has embarrassed OK by calling global warming a “hoax.” Rice’s strategy seemed to be working, but as the race has come into the final stretch, Inhofe has lengthened his lead. Here Obama has a negative effect and the Democratic name suffers accordingly–although I doubt Hillary Clinton would have any coattails here, either. Unless, Rice can find a way to hammer Inhofe on the economy, I don’t see him having any chance this year. Maybe in the future. Almost certainly, and sadly, GOP retention. Maine: Rep. Tom Allen (D-ME) should have had a strong race against Sen. Susan Collins (R-ME) in a state and region where Democrats now outnumber Republicans 2-1. But, although Collins has been voting as a Bush clone since ’06–as Allen has repeatedly pointed out, the state newspapers have continued to hail her as a moderate Republican. 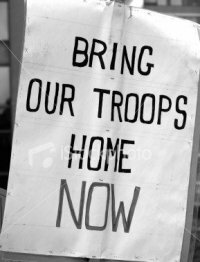 They have buried her votes for the war and for much else that Maine abhors and all of Allen’s attempts to reverse this reputation of hers have been for naught so far. Unless Allen can tie Collins to the economic mess, I don’t see how he can close the gap at this late date. This was a surpise. Everyone, including me, thought this would be a likely pick-up for Dems–ahead of other races that HAVE become very competitive. Well, there it is. It is likely that Dems will have to settle for less than a 60 seat majority. But things are MUCH closer than even 3 weeks ago, so, who knows? Martti Ahtisaari (b. 1937) , the former President of Finland, has been selected as the winner of the 2008 Nobel Peace Prize. 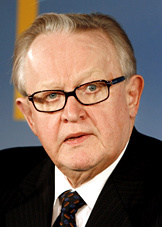 In their announcement, the Nobel Committee said that it was awarding Ahtisaari the Peace Prize “for his important efforts, on several continents and over more than three decades, to resolve international conflicts.” Ahtisaari has been involved in conflict resolution in Namibia, Aceh, Indonesia, Kosovo, and Iraq, among other places. As every year, the Nobel Peace Prize will be awarded in Oslo, Norway on 10 December (International Human Rights Day) by the chair of the Nobel Committee in the presence of King Harald V of Norway. After a speech by the Nobel Committee Chair citing the Laureate’s accomplishments and the reasoning of the Committee in his selection, the new Laureate will give the traditional Nobel lecture. 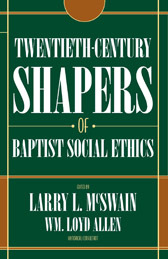 You can read past lectures (many of which, such as Martin Luther King, Jr.’s, Archbishop Desmond Tutu’s, Jimmy Carter’s, Muhammad Yunu’s, etc. are really moving) here.